The Crusader's heart's desire is to spread the Word of God through the preaching, singing and testifying as doors are open. We do not like to miss an opportunity to share Christ, because we believe there could be someone lost in each service or someone needing encouragement from the Lord. God wants to use us, to plant a seed, harvest a seed, or plow the field. When we don't show up, as commanded, then God's Will is not done, in our lives. Luke 9:62 and Jesus said unto him, "No man having put his hand to the plow, and looking back, is fit for the Kingdom of God." We and the people miss the blessings of God. The Crusaders feel the Lord has called us especially to the church, to minister to the congregation and hurting people. The Church must become the church that cares, that forgives, that ministers, and that Stands on the Word of God for Their Source. The Crusader's Ministries are based out of Magnolia, Arkansas. We began this journey in 1988 singing Southern Gospel Music & sharing our faith through testimony. We have been blessed beyond measure. God has protected & lead us through the many years of traveling in a bus across the USA. The Crusader's Ministries are a full time EVANGELISTIC ministry supported solely by the offerings of individuals and churches to carry the gospel. "Altars Alter Families" Tour has been extended into 2013. We believe rebuilding broken marriages, families and lives will begin at the altar. The Crusader's Ministries Saw 632 people saved in 2012 and 297 people saved during the services in 2011, across the USA. The Crusaders are an EVANGELISTIC TEAM doing the Work of the Lord. God has given us the desire to share our testimony, our hurts, our failures, our trials & our blessings to reach a hurting & lost world. More than anything, our desire is to share the Saving Power of Jesus Christ to everyone. The Crusader's Ministries feel the Lord has called us especially to the church, to minister to the congregation & their hurting people. 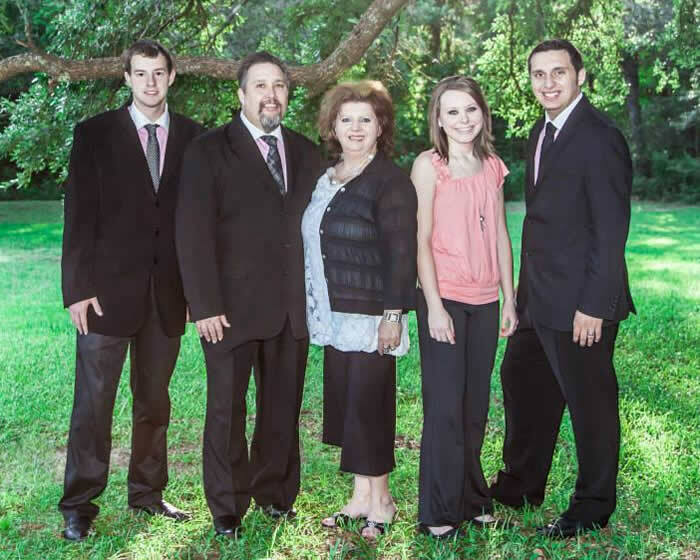 The Crusader's Ministries members: David Talley, and wife Penney Wise Talley, their son Jonathan, his fiancï¿½, Ashley Dossett, along with Steven Hayes. Each have an important part in the Evangelistic Team, from preaching, singing, video, sound, testimonies, speaking, working altars, studio work, leading people to the Lord, altar workers and being a Servant to the church. We have completed 13 projects. The newest two being Still Amazed & Those Hands Those Feet. Title songs, Those Hands Those Feet hit the Christian Voice Charts in 2013, written by David Talley. A new Project, is to be released in the fall 2013. Also available on product table Christian Jewelry, Tshirts, Cookbook with CD, the American Flag, autograph pictures, Christian books & pictures, along with info on upcoming concerts and conventions. MEMBERS: David Talley (Evangelist, Baritone, Keyboard, and Song Writer) - is the founder of The Crusader's. He surrendered to the ministry in 1988 after attending a Cathedral concert in Magnolia, AR. He can now look, drive by daily or stand on his front porch & be reminded of His Calling. David lives right across the street from the auditorium where the concert was held. David?s sincere desire to see people come to the Lord is shared during the services. He preaches, leads in the worship service, sings baritone, plays keyboard, drives the bus and is the primary contact for scheduling a revival or service at your church or event. David was Ordained into the Gospel Ministry in April 2012. David has been married to Penney since 1982. Penney Talley (Administrator, Promotions, and Purchaser) - Penney writes the newsletter on a regular basis; recapping the services & concerts, along with listing promos and videos on Facebook. Penney also speaks at ladies' venues and works the altars during services. Penney's love for the Lord has made it easy to make the sacrifices to serve alongside her husband for the many years in ministry and marriage. Penney also works hard providing items for churches to promote the services for Crusader's and DSQC. The Talley's, have two children, Amber Byrd and Jonathan. Amber is talented also, singing & playing the saxophone, sometimes accompanying in the services. Jonathan, you will meet in services as the lead singer of the group. Jonathan Talley (Lead Vocal, Guitar Player, & Song Writer) is the lead singer for The Crusader's Ministries. Jonathan is a very gifted artist and is learning how to master his gifts that God has given him. Along with being an accomplished vocalist, Jon has also written several songs that The Crusader's perform. Jon's songs are on CDs that are available at the product table. Jonathan also plays the guitar and cuhan (box drum). Look forward to Jonathan, sharing His testimony, of being raised around the church, serving God, and the difference in thinking you are saved and KNOWING YOU ARE. He is engaged to Ashley Dossett and plan to marry in Dec. He was also a state winner in the 2006 Bible drill competition. He has been singing in services since he was 1 year old, at age 9, he began to play the drums for The Crusader's and continued till age 13, when he became the lead singer. Ashley Dossett (tenor) joined our Ministry team over 3 years ago as she began to date Jonathan Talley. Ashley and Jonathan Talley are engaged to be married Dec. 14th, 2013 . She is The Crusaders Ministries Tenor Singer, as she let go and let God, we seen God open her mouth to sing, like never before. She works hard at the product table assistant and promotions, along with everyone in the studio. She also works the altars, and shares her testimony of being recently saved, after a lifetime of being raised in church. Ashley is originally from Ashdown, AR. Ashley also co-writes songs with Jonathan and David. Steven Hayes (Video and Sound engineer) is originally from QUEEN City, TX. He runs the sound & video during services. Steven just recently got saved, after battling with the age old question, What will people think? Steven preached his first sermon on his 21st birthday, after surrendering to preaching the gospel. He is gifted to help with any technical need of the ministry. 90% of our services are streamed live and can be viewed on our website. A strong area of our ministry is the LIVE SERVICES we offer to the public Web fans. Many homes are reached thru this area of ministry. Services can be watch thru www.thecrusadersministries.com. The Crusader's Ministries are all members of Flower Acres Baptist Church in Texarkana, TX. We have the love, support and prayers of a wonderful Christ center, God fearing church. The Crusader's Ministries is a 501(c)(3) non-profit organization. We claim this scripture and we ask you do also, as you GIVE TO THE CRUSADER?S MINISTRIES: ROMANS 10:14-15 How then shall they call on Him in whom they have not believed? And how shall they believe in Him of whom they have not heard? And how shall they hear without a preacher? 15 And how shall they preach unless they are sent? As it is written: "How beautiful are the feet of those who preach the gospel of peace, Who bring glad tidings of good things!" JOIN OUR EMAIL NEWSLETTER: Send us your email address to d-talley@sbcglobal.net or register on website be added to our newsletter, being read by hundreds. ALSO find us on Facebook, The Crusader's Ministries (group & page) PLUS the Live viewer Page. DO NUMBERS MATTER? YES, THEY DO?..IF IT IS YOUR SOUL. The Crusaders will finish 2013 with 250 plus services for The Lord and 365 days of serving Him. There have been many saved in the services this year. There have seen rededications, lives touched and changed. DEEP SOUTH QUARTET CONVENTIONS: Another avenue to reach people for Christ is DSQC, hosted by The Crusader's and local church. The Deep South Quartet Conventions Regional was founded in 2002 by David Talley, original member of The Crusader's Ministries. DSQC now brings regional conventions to areas across the South. In 2009, DSQC was taken on the road to new areas. DSQC has been held in AR, AL, OK, MO, and MS. More info on each convention is listed at www.ds-qc.org The Conventions brings a five day event with two concerts to the local church, along with prayer & commitment time, ministry worship for the regional groups, while reaching the community. These concerts host 8 to 12 of the best regional groups in the area. This concert is open to the public for a love offering. The Concert is sure to be a highlight in your life. The groups sing from the heart and minister to you through song and testimony. This is the Convention of the year for us. To book at your church, call David. MASTER'S MASTER STUDIO: is owned and operated by The Talley's, located in a Victorian two story home over 110 years old, located in Magnolia, AR. Enjoy the peacefulness of being in a Christian, spirit filled home to record your next CD Project. The Studio suite is available for overnight guest, sleeping up to four people, with private bath. Master Master Studio has some of the latest digital computerized equipment for recording. Studio also offers duplication to many artist. The Crusader's Ministries are available for live instrumentation, also. Each project is designed to meet your specific needs. Call for quote and to schedule.